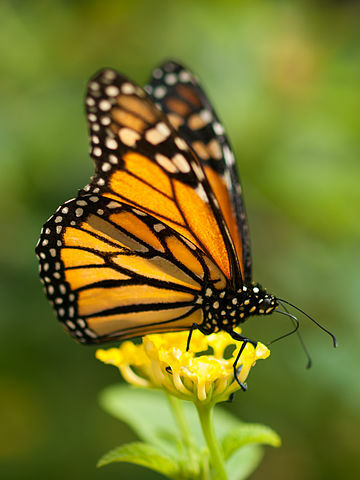 For as long as anyone can remember, monarch butterflies have arrived in Mexico’s Trans-Volcanic Belt in late October, when the locals begin to celebrate Día de los Muertos, the Day of the Dead. Families fill their homes with marigolds, eat skull-shaped sweets and place candles on graves to guide the souls of departed loved ones home. According to traditional belief, the brilliant orange butterflies are the spirits of ancestors returning to earth to visit. Steep, fir-clad peaks are scattered across the volcanic arc from Jalisco east to Veracruz, but most of the butterflies spend the winter on just a few of them, in an area protected as the Monarch Biosphere Reserve. In the cool, thin air between 9,500 and 10,800 feet they huddle together by the thousands on oyamel fir trees(Abies religiosa), commonly called the “sacred fir” because of its narrow, conic tip that resembles clasped hands with fingers pointed upwards, praying. 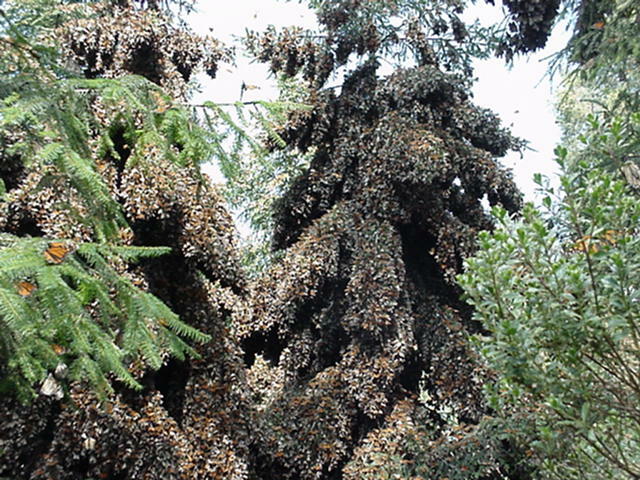 These dense, dark-green conifers protect the monarchs from cold and rainy winter nights. A billion butterflies once fluttered down from as far as southern Canada to paint the firs a quivering crazy quilt of orange and black with white spots. But due to the usual litany of destructive factors — from the deforestation of Mexico’s oyamel fir trees to the loss of milkweeds, the primary host plants for monarch caterpillars up north — their numbers have plummeted. By 2014, there were just 33 million of them. Although they have ticked up slightly since, their numbers remain perilously low. And now an additional threat — the devastating impact of climate change on the butterfly’s wintering sites in Mexico — is fast becoming clear. In addition to deforestation, the oyamel is suffering from progressively hotter, drier conditions. If the damage continues and the trees can no longer provide a refuge, the iconic migratory butterflies will face yet another challenge. Scientists are in a race to save these firs and the butterflies that depend on them. The breakneck speed of current global warming dwarfs anything in the fossil record, even what Lee Kump, professor of geosciences at Penn State University, has called “the last great global warming” 56 million years ago during the Paleocene-Eocene Thermal Maximum. At that time, over the course of a few thousand years, global temperatures soared 9°F as the supercontinent Pangaea broke apart. By comparison, if carbon emissions are not slashed soon, scientists warn it’s possible we could witness that much warming in a matter of centuries, if not decades. Without human help, trees and many other plant and animal species most likely won’t be able to migrate fast enough to keep pace with rapidly changing conditions. There is a combination of challenges that scientists use to identify flora and fauna most imperiled by climate change — and the oyamel meets most of them. Already forced to retreat to higher altitudes when the world warmed after the last Ice Age, it’s running out of options as temperatures spike even higher today. Once more widespread, the oyamel fir trees are now fragmented into small, widely scattered populations that lack resilience and run a high risk of extirpation from random events. The extraordinary measures being taken on the tree’s behalf are a textbook case of how efforts to save species threatened by climate upheaval are fraught with complexity. For the past several years, Sáenz-Romero and his colleagues have painstakingly prepared to move the oyamel to more suitable climes. Early studies determined that trees growing at a particular altitude are genetically different from populations at other elevations. Seed was collected along an altitudinal gradient to capture this genetic diversity, and then germinated. The planting this past summer was designed to test which of 10 genetically distinct populations — a shift upwards of almost 1,500 feet in altitude for some of the seedlings — would fare best. Because conditions projected for 2030 do not yet exist in places where the seedlings were nestled into the mountainside, they face the risk of frost damage from the current climate. And since global warming is promoting more extreme weather of all sorts, from heat waves and droughts to downpours and cold snaps, they’re also likely to be confronted by climates with no contemporary analog. “Today’s trees are not adapted to this,” says Sáenz-Romero. “Even if we move the populations to the correct spot, there will be large casualties.” To further complicate matters, at about 13,000 feet, above the tree line, the soil is very poor. If it becomes necessary to move the trees that high, organic soil would need to be carted up the steep slopes to the planting sites. Unlike this summer’s small assisted migration trial, a massive reforestation effort will be required before too long. Sáenz-Romero expects this to be undertaken by local communities that survive on monarch-based ecotourism, with the aide of governments and private groups abroad. However, the hardest part, he contends, will be convincing ecologists and conservationists in time that assisted migration is essential. Forest geneticists point to iconic tree species already being clobbered by climate disruption, including rare and genetically unique evolutionary relicts such as the giant sequoias. They also worry about potentially catastrophic declines in the productivity of widely dispersed stalwarts of the timber industry like ponderosa pine and Douglas fir. Land managers “need guidelines now,” says Rehfeldt, the retired USFS geneticist. For full-scale assisted migration to become a reality, more ecologists and conservationists will need to actively support it, forest geneticists say. A large reforestation program for the oyamel or any other tree would be expensive, notes Rehfeldt, and unlikely to be funded if there is even a whiff of controversy. Meanwhile, the race against time continues to prepare the sacred fir for whatever the future holds, lest it and countless other plants and animals become departed spirits remembered each year, like human loved ones, on the Day of the Dead.